w:55 x h:81 cm; 32" x 22"
"It was once claimed that the human eye could only distinguish between 16 shades of grey, but the numbers increase with research and a new limit of the human visual system is set at about 1000 shades of grey under optimal conditions. One of the challenges of painting is to "see" with and without colour so that the light/dark contrasts reach a balance. We squint and step back to "see" the image better. The more we paint the more we can control those shades of grey even when using full colour." "I rarely use black paint preferring instead to play with the myriad of greys resulting from blending opposing colours with white." "I am fascinated by what we can see with our eyes closed. It reminds me of the interconnectedness of all the worlds: macro/micro, inside and outside us. There is an energy, an invisible spirit within us that surges like a river, our veins somehow become visible for a few seconds just after we close our eyes. Some of the effects suggest a kaleidoscopic image of some strange inner geometry." 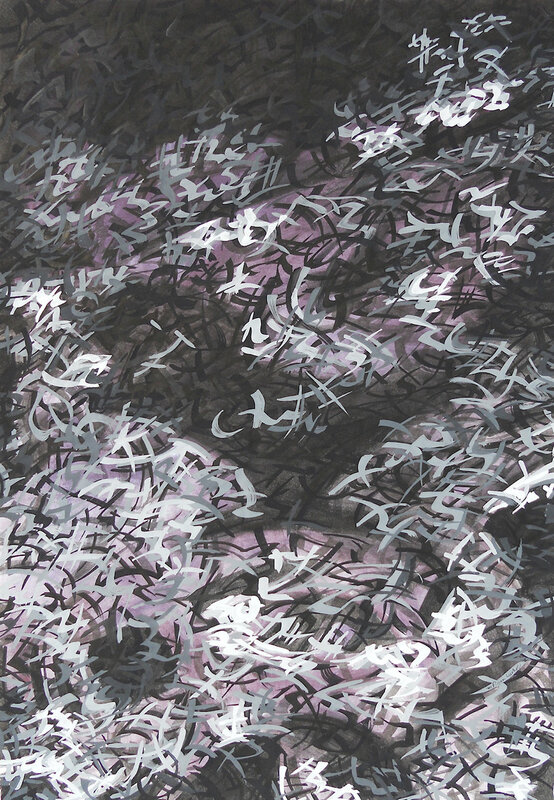 "Mark Tobey's work has been an influence in terms of the calligraphic strokes in this work and others. When the materials work with us, it is pure magic to observe the brush strokes form themselves. "